Around 6 million visitors a year flock to the Bavarian city of Munich to experience the real authentic Oktoberfest that started here. 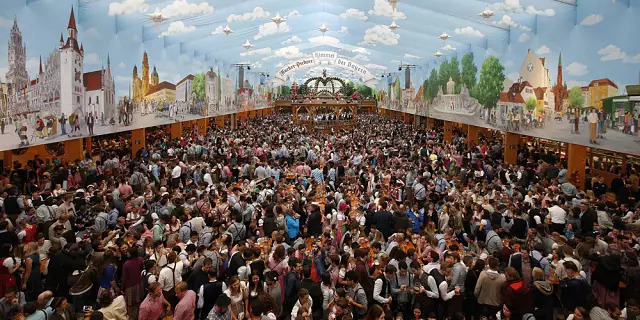 Many places have replicated this famous beer festival around the world, but nothing beats the original Lederhosen, Dirndl dresses, delicious food and traditional music with family and friends in the autumn atmosphere of Munich. Celebrating in true style we will guide you through plenty of options at the Theresienwiese grounds or in town if you’re unable to enter the tents or secure a table reservation during your stay. Be sure to plan ahead. If you plan to go during the weekend, be prepared for long lines with the possibility of some tents closing their doors by 4 pm due to full capacity. You can walk the outside of the parks, visit nearby bars or enjoy the rides at the amusement park if this is the case. 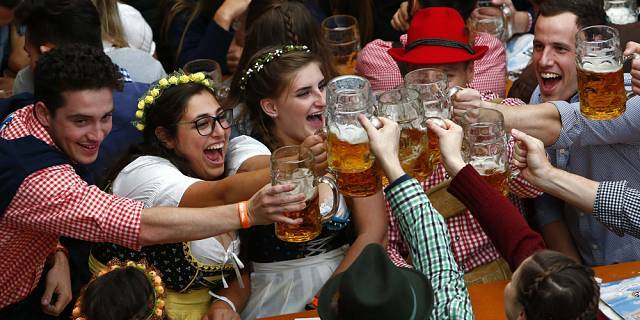 Oktoberfest is great for singles, couples and families alike. 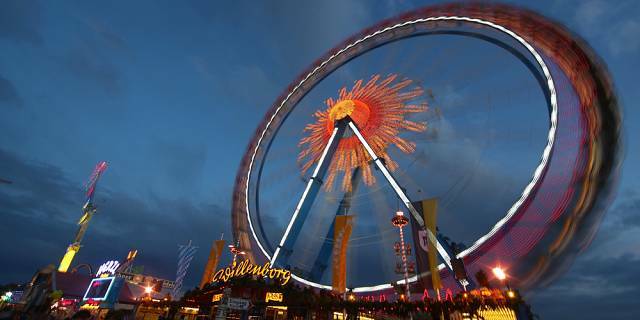 Oktoberfest itself is a sight to see with dozens of tents, state of the art amusement park rides and thousands of people. 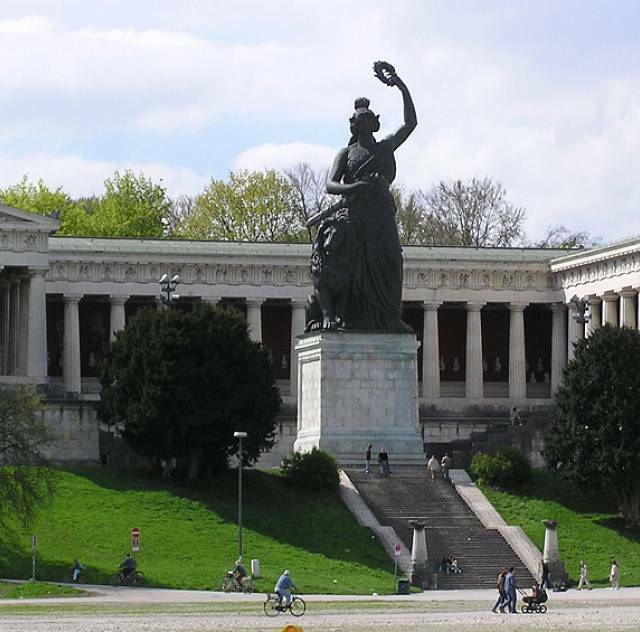 When you arrive in Munich, I suggest you find the Bavaria statue for a memorable snapshot. The statue depicts a woman holding in her left hand a wreath of victory, in her right hand a sword, while a majestic lion sits by her side. The bronze stands at 18.52 metres and weighs in at 87.36 tons. It was commissioned by Ludwig I of Bavaria and dedicated in 1853. The traditional Dirndl dresses are stunning and the Lederhosen is fun to see for festival-goers of all ages. 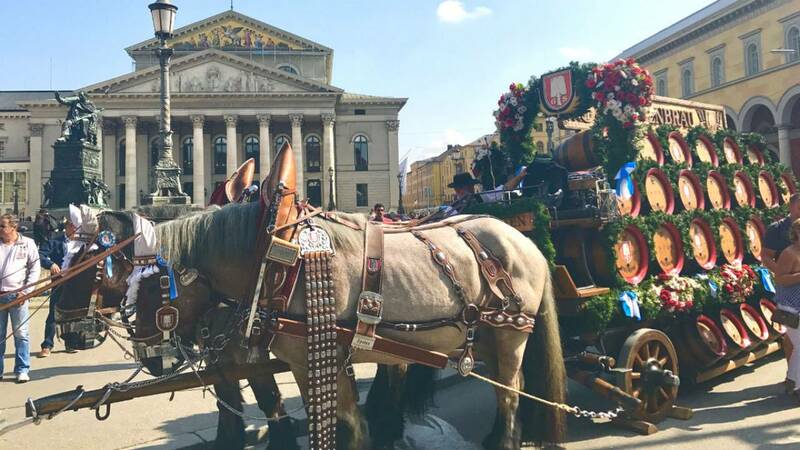 The Platzl Hotel offers a cute traditional central location in town and is near the infamous Hofbräuhaus restaurant (read more below). The new Roomers Hotel is a hip boutique hotel that offers a fabulous Asian restaurant, Izakaya, and there’s a small club in case you want to continue the party afterward. The five-star Bayerischer Hof offers a rooftop terrace for drinks or a sunset view, it’s centrally located to most shops with an open deck pool at their cool Blue Spa. There are approximately 30 tents of various sizes with many small food stands which offer sausages, fries and other traditional Bavarian dishes with beer. You’ll also find baked goods, pastries, fruit sticks (chocolate covered or plain) and bars with schnapps, vodka or wine options. If you prefer fish, there is “Fischers Fritze”, while smaller stands offer fish sandwiches. You can easily take the tube or grab a taxi to get to the grounds, but be sure to have a ride organised for your way back to the hotel. The Hofbräuhaus restaurant is located in the city center and can be easier to enter then the tents during peak Oktoberfest season. You’ll find a Hofbräuhaus tent on the grounds as well. The Käfer tent provides more food options that include roast chicken, duck with dumplings and red cabbage, or Schnitzel with potato salad, but there are many alternatives like pizza, fish, soups and amazing salads. German food or Okoberfest is not only about pork, sausages and beer. There are various wines, liquors and fruit juices to choose from. Apfelschorle is a delicious beverage of apple juice mixed with sparkling water. For desert, you must try the Bavarian tradition, Kaiserschmarren, a thick pancake that’s served with apple or plum sauce. You’ll have plenty of choices when visiting the many stands at Oktoberfest . A favourite of mine is, Lebkuchen – a soft, cake-like gingerbread biscuit that you can buy in various sizes. Some stands can personalise these traditional baked treats for you, which you can pick up in a few hours and eat them warm. If you don’t want to eat these delicious treats you can bring them home as a souvenir to hang on your wall or door – they last forever. I have one from 15 years ago that still looks the same. If you like nuts, buy any variety of cashews, sugar-coated or salty.